The next match for the Gibnuts came a few days after their victory in Belmopan. This time the Gibnuts took part in the Big Falls Futbol Marathon. The annual Big Falls School Bazaar is a major fund-raising event in the Toledo District and includes games, music, food, and a futbol marathon. Over twenty teams from around Toledo competed in this year’s single elimination tournament for the $400 prize money. The Gibnuts were ready to play, and came out strong during their first match against San Miguel Village. Due to a shortage of time and large number of teams the games were cut down to two 10 minute halves. The Gibnuts played great defense and held off San Miguel. The game came down to a shoot out match, and the Gibnuts won the game 4-3. The Gibnuts moved on to Round 2 where they met up with the Mopan Stars, an aggressive and quick team from Maya Mopan Village in northern Toledo. By this time the games were shortened to 5 minute halves, and the Gibnuts lost the game 0-1. Despite the loss, everyone had a great time at the Bazaar. The next Gibnuts match is scheduled for early January. 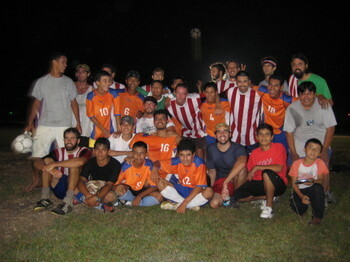 The night before our Thanksgiving meal, the Peace Corps Gibnuts played an outstanding game against the Belmopan 4-H. The Gibnut players exhibited good team work and great communication on the field. The final score was Gibnuts 5, Belmopan 4-H 1. This is the first victory for the Peace Corps Gibnuts in a year and half, and everyone from the Office Staff to the fans were so excited about the long awaited victory. Last week schools across Belize celebrated Children’s Day. This day is set aside to honor the children of Belize with fun and activities. Little Flower R.C. traveled to Barranco Village for a day of games and culuture. Students from Barranco gave Little Flower students a tour of the village, which included a visit to the late great Andy Palacio’s grave. A futbol game between the schools wrapped up the day with John as referee. Children’s Day at St. Benedict R.C. was full of fun and outdoor games. Students participated in the three-legged race, sack race, relay race, and marble & spoon race. We had a school wide limbo and high jump competition, and the biggest game of musical chairs I have ever seen. The weather was beautiful and everyone had a great time. Once again, Children’s Day was a success. Students at St. Benedict R.C. School playing marbles. Last weekend we traveled to Guatemala City to take the GRE. The Graduate Record Examinations, or GRE, is a general test that measures verbal reasoning, quantitative reasoning, and critical thinking and analytical writing skills. We took the water taxi across the Gulf of Honduras to Puerto Barrios, Guatemala. From Puerto Barrios, we loaded onto the Litegua Charter Bus and headed to Guatemala City. We stayed in an approved Peace Corps Hotel and spent the weekend taking it easy and getting our feel for La Zona Vida. Bright and early Monday morning we headed to Instituto Guatemalteco Americano for the exam. We were ready, and by noon, we had both finished the test, received our scores verbal and quantitative reasoning sections, and were on our way. We are both satisfied with our scores, and we are now onto the next step of applying to Graduate School. We spent the rest of our time in Guatemala eating great food and shopping. Tuesday morning, we began the journey back to Punta Gorda. Relieved to be home, we soon got the news that Tropical Depression #16 was on its way to Belize. Peace Corps took necessary precautions to ensure our safety and consolidated all Volunteers posted south of the Sitee River to Belmopan. The tropical depression has dissipated, but there has been some flooding and high water levels in various parts of Belize. Everyone is safe, and we are currently awaiting news of when we will be allowed to travel back south. During IST the Peace Corps Gibnuts had a futbol match against the JV team from Armenia. Armenia is a small village just south of Belmopan on the Hummingbird Highway where we stayed during our Center Based Training. Armenia takes their futbol very seriously and is home to the National Futbol Champions of Belize. The Gibnuts showed up in full force and ready to play. The crowd cheered loudly as the Gibnuts played their hearts out. After a long battle, the score was 3-3, a draw. Tired and worn out from such an exciting game, they called it day. You can bet there will be a rematch. Go Gibnuts! The Tumul K’in Center of Learning in Blue Creek offers post-primary education while incorporating the values of Maya Culture and heritage. In working towards keeping Maya traditions alive, last weekend Tumul K’in presented the sacred ball game of the Mayas, Chaj Chaay. Chaj Chaay is a game played between two teams of up to 4 players. The players are usually painted and adorned to represent the warrior Eagles of the Orient and the warrior Jaguars of the Occident. The ball game represents the struggle between necessary oppositions; light and darkness, man and woman, water and fire, birth and death, heat and cold, good and evil. A solid rubber ball weighing 3 pounds or more, is passed back and forth between to the two teams. Players use their hips and legs to move the ball, and it is imperative to have quick reflexes as the ball rebounds at a very high speeds. The ball game is played in the Jom, a place of much respect, as it is also a ceremonial altar. There are two ways to win, either by having the ball pass through the suspended ring, known as the Lupjom, or by accumulating a total of 8-0 points. A team earns points by hitting the ball across the opposing team’s line. Each time a team scores, a point is taken away from the other team. On Saturday night we headed over to the PG Sports Complex to watch the Chaj Chaay. A traditional ceremony along with Marimaba music and the sound of the conch shell opened the game, and the players from Instituto Kukulkan in Gautemala were honored and blessed. The Black Jaguars wore dark clothes and their bodies were painted dark blue. The Red Eagles wore red clothing and their bodies were painted with traditional symbols. The game was pretty intense as players displayed amazing strength, power, and agility to send the ball across the basketball court. The crowd cheered as players attempted to pass the ball through the Lupjom several times, missing only by inches. It was a tough battle, but in the end, the Red Eagles won. They danced around the court with pride and excitement. What a great experience it was to see this ancient Maya tradition played.